Out of the blue, my phone started alarming with notices from the Sacramento Bee. There was a traffic situation in Auburn, approximately 20 miles from our house. The police had blocked traffic around the Foresthill Bridge because there was a jumper situation. 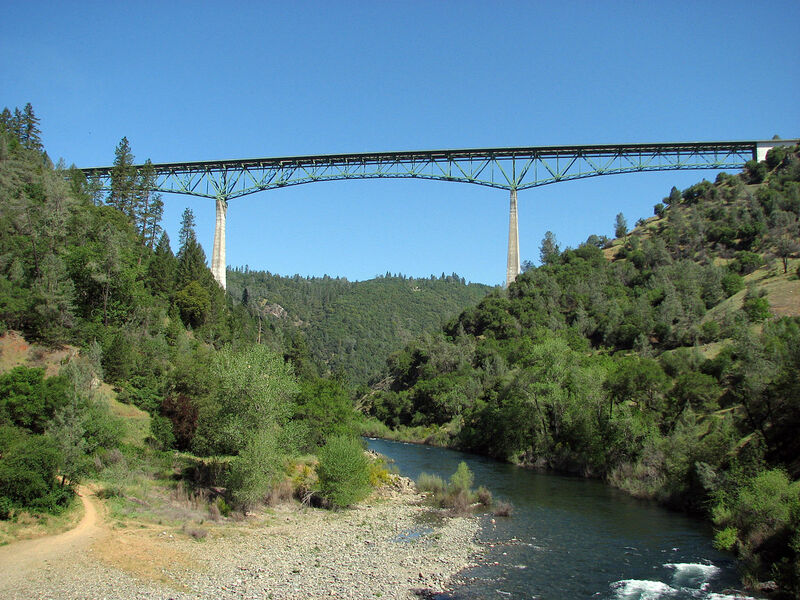 We had driven across the bridge and even hiked under it, but until I received the alerts, I never realized the bridge towers 730 feet over the North Fork of the American River, making it the highest bridge in California and 4th highest in the United States. Two days after the jumper situation had the bridge closed for 4 hours, Kellisa and I had a few hours with nothing to do. It was only 81F outside, so we wanted to be outside, but didn't have enough time for a trail. My thoughts went back to the bridge. We've flirted with the idea of walking across bridges in the past, but many don't have lanes or walkways for pedestrians. The first and only bridge we've crossed was the Francis and Mary Usina Bridge back in St. Johns County, FL. A quick Internet search revealed that you could walk across the Foresthill Bridge on both sides. We now had a plan. Less than 30 minutes later, we were parking in a dusty lot just before the bridge and a few minutes later we were walking towards the bridge when we saw a phone with a large sign instructing anyone thinking about suicide to pickup the phone and a counselor would answer. The bridge had a total of 6 of these phones. We enjoyed the views of the canyon as we crossed the bridge. I pointed out the Lake Clementine Trail far below and the Mountain Quarry Railroad Trail farther down the canyon as the two trails we previously hiked together. As expected, the noise from cars and trucks racing by was less than enjoyable, but it was offset by the shaking from the bridge vibrating below us. We crossed the entire bridge and returned on the other side to fully experience the bridge. Besides the vehicle traffic, the bridge was mostly ours as we only saw one other walker, a couple of bicyclists, and a family that just walked a few feet onto the bridge for the photo opportunity. The bridge has a high metal rail to prevent people from jumping. Thankfully, the lady jumper from 2 days before our visit was safely removed from the bridge without any harm to herself or the rescuers on scene.